Hello there to everyone who checks in every few months to find that we're still on semi-permanent hiatus! Jessica and I both have lots going on right now, and we decided a while back that regular updates are, for the moment, too much to handle. It was a strange feeling, when I baked my first cake after that conversation last summer, to realize that I didn't need to take pictures. I hushed the voice at the back of my head that said, "Explain why you're separating the eggs. Think of a narrative for this cake." For now, I wanted to share a fairly major project in which Allen’s considerable handyman skills were completely crucial – I could never have done this on my own. We have a small kitchen, and we use it pretty efficiently. We utilize a lot of specialized storage devices, like spice jar holders that mount to the inside of cabinet doors, and a magnetic knife rack that I jerry-rigged with metal rulers and super-strong magnets. But Allen’s parents gave me a pasta maker for Christmas, and it’s the first item that, truly, no amount of kitchen reorganization would accommodate. It was re-do the kitchen, or move. Of course, neither of those is truly an option right now. But I had an “Aha” moment over this pin on Pinterest, and it blew my mind that I’d never thought of moving our existing cabinets up to the ceiling and putting open shelves below. I'm not going to go into too much detail with this post, since Allen, my in-house carpenter, handled most of the carpentry construction details. 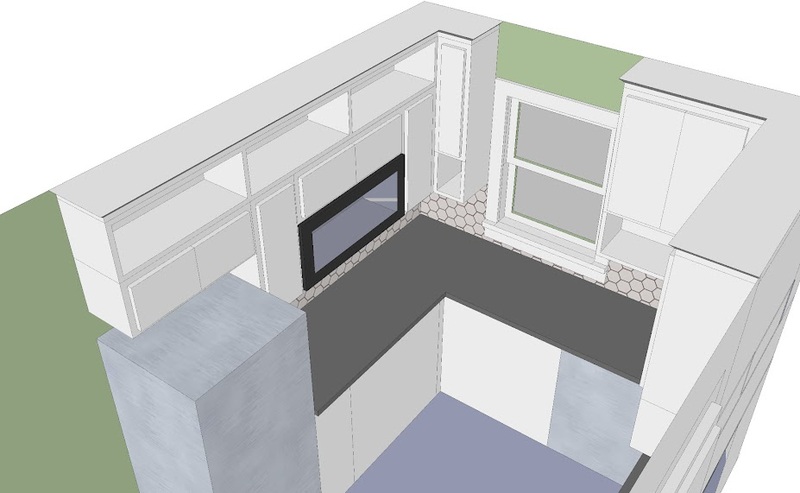 I measured the existing cabinetry, counters, and windows in our kitchen, and drew up a half-dozen models in SketchUp, which is a free program from Google that I’d recommend to anybody for projects like this – it’s easy to learn, and it’s a great tool for space planning and visualization. Between the look of the models, our space-usage goals, and concerns about the complexity of building new shelving, we decided to build shelves above the existing cabinets on the left side, and to move the cabinets up to the ceiling and build shelves below on the right. I also had several heart-to-hearts with the manager at my Sherwin-Williams store. I love the hard enamel finish of oil-based paints, which I used on all our interior doors, but light-colored oil-based paints yellow over time, which is a problem we already had with our cheap paper-laminate cabinet boxes. He steered me towards an acrylic enamel, and although latex paints will never achieve as hard a finish as oil paints, I’m very happy with it. Before priming and painting, I caulked all the joints in the cabinet boxes, which made a surprising difference – the assemblies looked more monolithic and less cheap. I painted all the cabinet boxes – upper and lower – on my own while Allen was out of town, and used epoxy to repair cabinet doors where the vinyl laminate had peeled at the edges. I used XIM adhesive primer on said cabinet boxes, and I left alone the vinyl-laminate cabinet doors completely. Since I wasn’t painting the cabinet doors, the paint for the boxes had to match the doors pretty perfectly, and after a bit of guessing, painting, and second thoughts, I ended up with about a 30% tint of Alabaster, in a mixture that was about 25% satin and 75% semi-gloss. I used white nap mini-rollers to apply both the primer and the finish paint, thinning the paint a little with water. 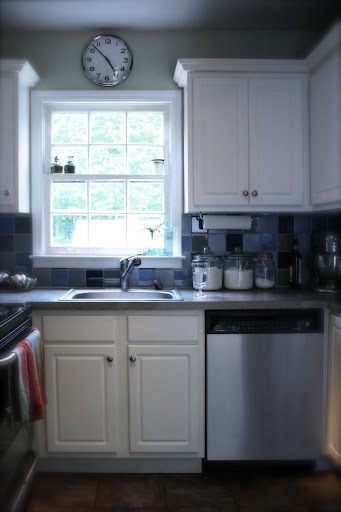 The caulking and painting improved the existing cabinets tremendously. I helped Allen move the right-side cabinets to just shy of the ceiling (to accommodate new crown molding), and helped however I could with the new carpentry. This job was so custom to the particular configuration of our crappy cabinets, that I don’t think construction details would be too helpful to share. We mostly used poplar for the new construction, as it’s hard, cheaper than oak, and has a tight grain. The final (though not particularly easy) touch was crown molding that wraps all the way around the kitchen, incorporating the cabinets. This project has changed the whole look of our kitchen – I keep telling Allen, “It looks so expensive!” It really looks like custom cabinetry – which, it sort of is now, isn’t it? We get to display our pretty second-hand glassware, and we’ve freed up some valuable counter space with all the extra storage. I’m so grateful I have a handyman who’s willing to work for baked goods. It truly looks lovely. Thank you for sharing- it was inspiring. While I can't do anything similar in my own kitchen, it did get me thinking about what I could maybe do to increase the efficiency and storage in my small kitchen. Thank y'all so much for the comments and encouragement! Tempted to post that email you sent me about the state of chaos this created in the homestead . . .
Gorgeous! It is so beautiful. Wish to live in there so much. Excellent point. I will definitely try to implement some of them! This is exactly what I want to do, so nice to see someone else has done this first! I've seen so many DIY shelves under, but I like the box look a lot better, more cabinet-y. Yours look SO GOOD!! How did u make the shelves underneath,material etc? ?